Amazon.com description: Product Description: Did you know that getting on the treadmill can help keep your brain sharp? Or that repeatedly staying up to catch the late show could increase the likelihood of being struck down by dementia? The dozens of choices you make over the course of any average day all add up. Together with your family history, they establish your chances of getting Alzheimer's years from now. No drugs or procedures can cure or even effectively treat Alzheimer's yet. But you have the power to help reduce your risk of ever getting this terrifying disease. Based on the latest scientific research, Outsmarting Alzheimer's gives you eighty simple lifestyle prescriptions in the six key areas with the most scientific evidence for protecting your brain health. These easy, low-cost, and fun brain-boosting activities can help you delay or even avoid the onset of Alzheimer's disease and dementia, mitigating symptoms like forgetfulness or depression and sharpening your mental edge. 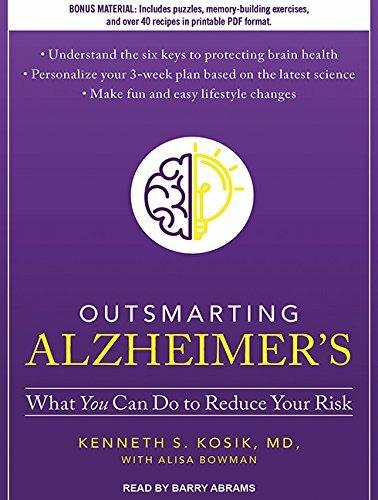 With a personalized three-week plan that includes recipes, brain games, and exercises, along with advice for caregivers, Outsmarting Alzheimer's is your best shot at staying sharp and vibrant for life.